In October of last year I received permission from my HOA Board of Directors to transform my front yard to a Florida-Friendly landscape. This change has had a full year now to grow in and mature. I must tell you that it has surpassed my expectations. I did not expect it to look as full and lush as it does now. 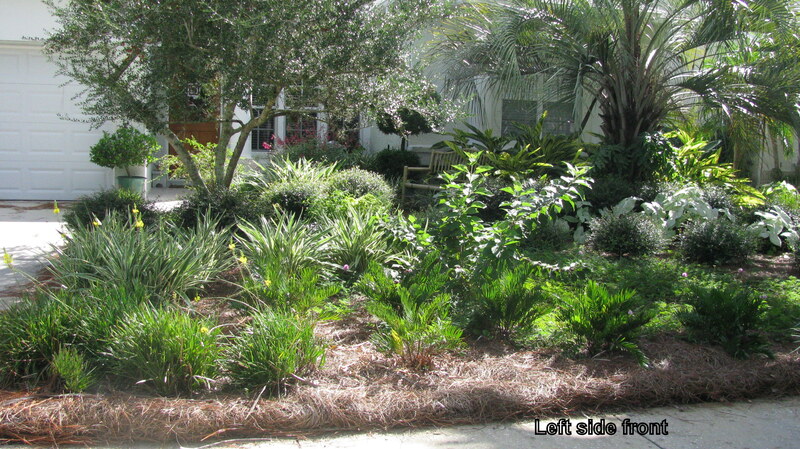 I used both Florida native and exotic (non-native) plants for my design. All of the plants are fairly cold hardy and drought tolerant. Some were already in the landscape and they were retained and incorporated into the overall design. 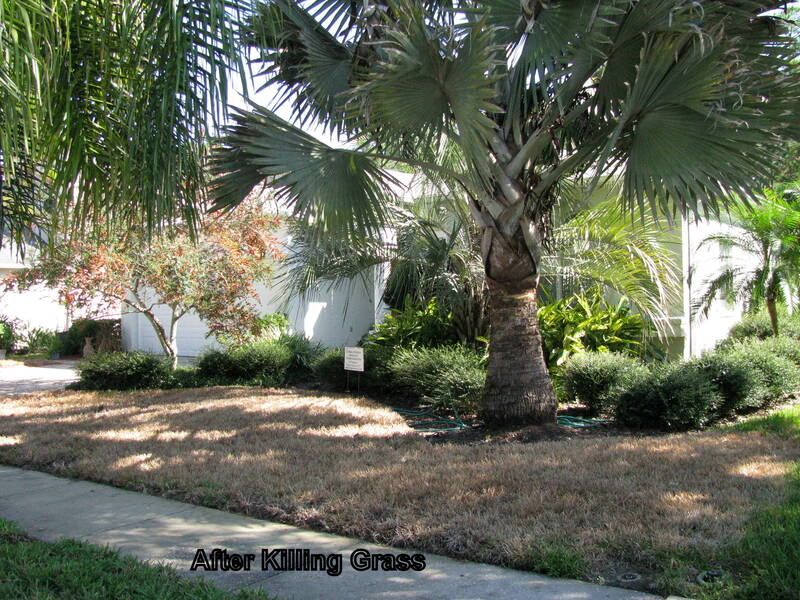 But, all of the St. Augustine grass was removed – or more correctly killed. 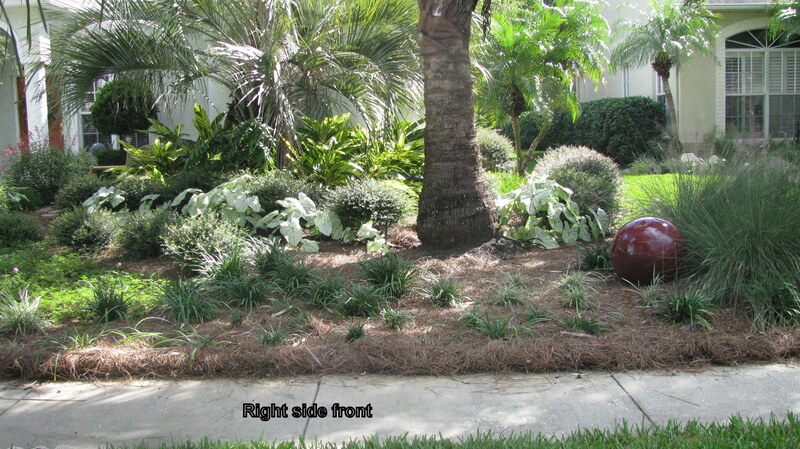 Grass does have a place in a Florida-Friendly landscape if it is properly maintained and needed for pets or children. But, it does require the most fertilizer, water, pesticides and maintenance. I sprayed all of the grass with Round-up in October to kill the grass and any weeds. Once the grass was dead, I did not disturb it except to plant directly into the dead thatch. Once the grass roots were dead, it was easy to dig in the soil. By not tilling up the dead grass, weed seeds in the soil were not exposed to light. Most weed seeds need light to sprout, so by not disturbing the soil over the whole yard I had fewer weeds to contend with. The natives that I used are Dwarf Yaupon Holly, Gulf Muhly Grass, Coontie, Beautyberry, Sunshine Mimosa, Spider Lily, and a Sweet Acacia tree. The exotic plants that I added include Liriope (Emerald Goddess and Aztec), Variegated Flax Lily, Bulbine, Society Garlic, Mondo Grass, and Caladiums. The existing plants included a Yaupon Holly tree, Bismarck Palm, Pindo Palm, Variegated Shell Ginger, Podocarpus topiary, Asiatic Jasmine ground cover, and a Croton that barely survived the winter. The only thing that the deer have bothered is the Liriope which they keep pruned unless I spray it with repellent. Once everything was planted, I covered the ground with Eucalyptus mulch except along the sidewalk and driveway where I used pine needles. The pine needles do not wash away, so I expected them to hold the rest of the mulch during heavy rain, which they did. I have found that this landscape uses much less water, and of course, it doesn’t need to be mowed. I do still have grass in the area between the sidewalk and the street. This was my concession to uniformity for the street. I am now going to work on less grass down the sides of my house – I have nearly none in the back already. Sunshine Mimosa is growing in with the grass and hopefully will soon take over. 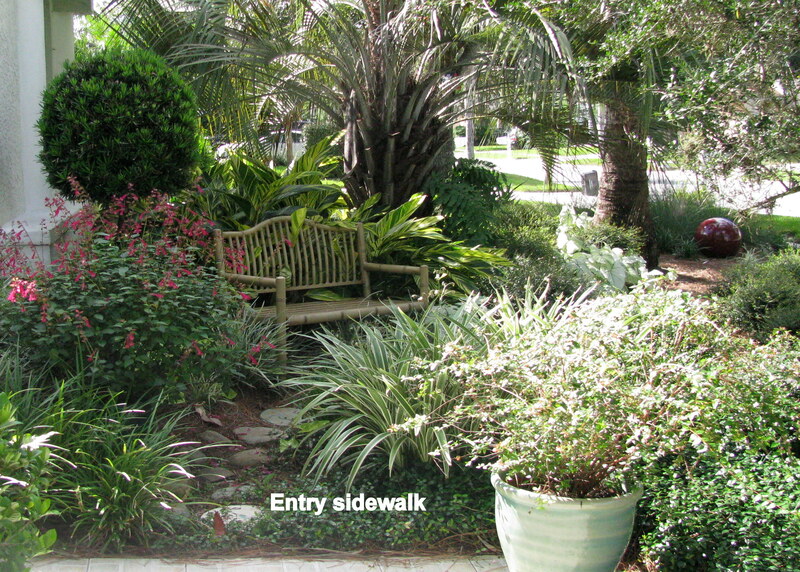 If you would like more information about Florida-Friendly Landscaping, you can give me a call or visit University of Florida/IFAS Florida-Friendly Landscaping on the Internet at: http://fyn.ifas.ufl.edu/. Is it cooler yet? Fall in Florida is a lovely time. The days are sunny, but a bit cooler and plants begin to perk up to the cooler night temperatures. This is a good time to consider growing some of your own vegetables as well. October brings the Pinellas County summer Nitrogen fertilizer ban to a close and we can fertilize our lawns before winter. Use a formula similar to 15 – 0 – 15 with 50% slow release Nitrogen (first number). Most Pinellas County soils contain naturally high levels of Phosphorus (second number), so "zero-phosphorus" fertilizers are the rule unless a state-certified laboratory soil test confirms a deficiency of Phosphorus in the soil. If you need to have a soil test performed, contact the IFAS Soils Laboratory (http://soilslab.ifas.ufl.edu/ESTL%20Home.asp) to obtain a soil testing kit, or call (727) 582-2100. Growing vegetables can be a challenge, especially when we must contend with deer, raccoons and armadillos. But, if you have a screened enclosure that is open to the sun, you can grow quite a bounty of vegetables this fall in containers without these pests and with fewer insect pests as well. Choose the site for your containers carefully since vegetables require at least 6 to 8 hours of full sun, especially those producing fruit like tomatoes and peppers. Lettuce and other greens withstand a little shade. Some good choices for containers are tomatoes, peppers, broccoli, eggplant, all kinds of lettuce and greens, peas and beans (may need a trellis). I even grew some small sweet turnips last winter. Plants like squash and cucumbers need pollinators not present inside the enclosure to produce fruit. Containers for vegetables should be large enough to hold the mature plant. A five gallon planter holds one tomato, pepper, or eggplant. Also consider window boxes or “grow boxes” that are specifically designed for vegetable gardening. Remember, holes in the bottom for drainage are important for any container you choose. Choose commercial potting soil containing some sand and perlite for drainage. Add some compost (Black Cow, mushroom compost, etc.) in the mix – about 1/3 of the total volume. Don’t use soil from your yard since this can add weed seeds, diseases, nematodes and harmful insects. 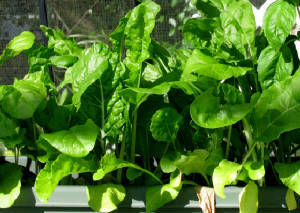 Vegetables grow fast and need a consistent source of water and fertilizer. Many containers need to be watered every day once the plants start to mature. Allowing the plants to wilt will reduce the yield and also affect the taste. Use fertilizer labeled specifically for vegetables like Dynamite. Incorporate fertilizer into the potting soil at planting following directions on the label. If you are growing tomatoes and peppers, add some garden lime to the mix also. Never use lawn fertilizers for vegetables. The ratio of nutrients is not appropriate. Since gardening in Florida is different, the University of Florida is the best source for information. Access these two publications on the Internet; “Minigardening (Gardening in Containers)” at http://edis.ifas.ufl.edu/VH032 and the “Florida Vegetable Gardening Guide” at: http://edis.ifas.ufl.edu/vh021. Vegetable Gardening in Florida by James Stephens is the best book to purchase for gardening information. It is a great resource that also contains excellent pictures of insect pests and diseases of vegetables.